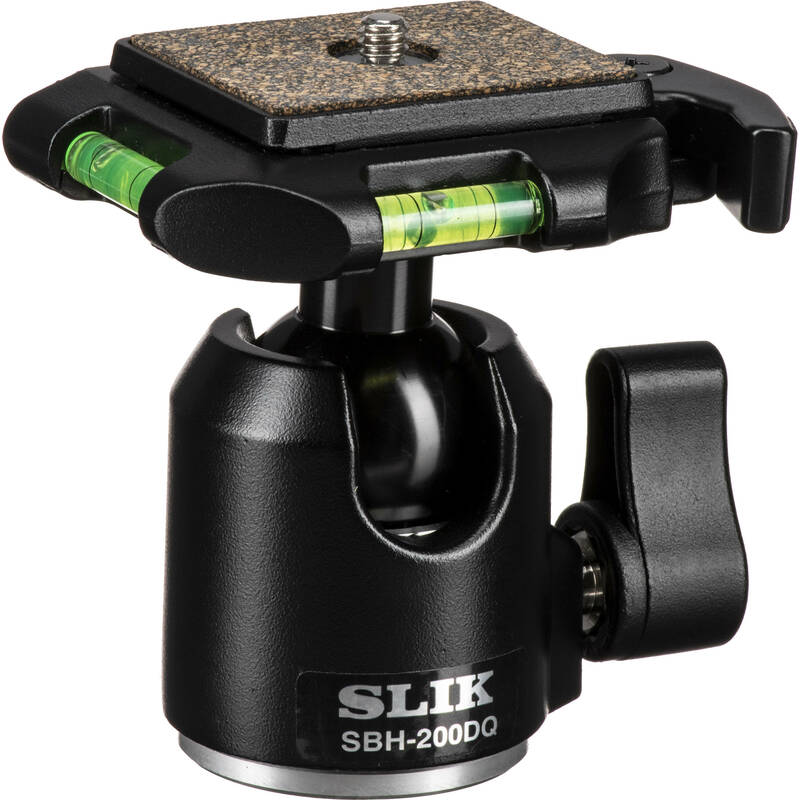 This Slik SBH-200DQ Ballhead with Quick Release is an all-metal head that is a part of the affordable, yet professional SBH-series. Slik Professional SBH-series ballheads are made with exceptionally fine machining and carefully anodizing of hardened aluminum parts, designed to give many years of trouble free smooth operation. These ballheads feature an easy to use, single knob operation to lock or release the ball connected to the camera plate. SBH-200DQ Ballhead with Quick Release - Supports 8.8 lbs (5kg) - Black is rated 4.7 out of 5 by 15. Rated 5 out of 5 by Brycee's Dad from A Rugged, easy to use I changed from using a pistil-grip ballhead for my heavy camera and lens (Sony A65 with Tamron 500mm zoom) because aiming and aligning the camera was cumbersome, and inaccurate. I found that releasing the trigger (to lock camera & lens) often resulted in a slight movement whereby the camera would be slightly mislaigned from the intended center of focus. Not so with the SBH-200DQ, which uses a single lever to move and lock the camera & lens. Couldn't be simpler: line up the camera & lens with one hand, move and lock in place with the other hand on the single lever. The grip is very strong and stable; this ball head is well designed and rugged. Rated 5 out of 5 by Steven from Fantastic Product I have a Slik Pro 500 DX that came with a 3-way pan head. I thought it worked well...until I tried this ball head! I can't say enough about this terrific ball head. I've taken about 500 shots over the past several weeks with it and it is just so quick and easy to use. Yes, it was an additional cost to the Slik Pro 500 Dx since it already came with the 3-way pan head...but believe me, in the field it is worth every penny! Rated 4 out of 5 by Kiwiken from Does the job. Nicely constructed and slick ball head. Does not slip even with a large camera and lens. Does not have safety to prevent accidental release. Price is very fair, Good product. Rated 5 out of 5 by Andrew from Excellent and exactly what I was looking for. Bought this to add to my Silk tripod. After taking off the old pan and tilt, this one fit perfectly. Holds the camera and lenses very sturdy with no shake. Even the big zoom lenses are held steady. Silk makes a very solid brand of tripods and ball heads. Can't wait to get out in the field and use it more. Rated 5 out of 5 by Ronald E from I had one already and I needed two more I use these on my mono pods and they can be changed to the tripod which has the same type mount. It makes things much easier and quicker when doing a wedding, taking scenics or actions photos. I may orer more if I get another camersa. I use two cameras now but am looking to buy a third for backup. Rated 5 out of 5 by rmaki from Fast and Smooth This is the second SLIK ballhead that I own. I bought this one to go with a new tripod, and I especially wanted on with a quick release mount (since my other ballhead doesn't have that feature). This device's operaton is fast, smooth, and easy. The quick release attaches and releases easily and quickly while still holding the camera securely. It has two bubble levels to aid in camera alignment. Rated 5 out of 5 by Buddy White Toes from Versatile and Sturdy This ball head is the most versatile, sturdy and ease of use attachment for our tripod we have come across. The quick release holds our heavy lenses perfectly when set at a vertical angle unlike our past 2 units. The 1 lever operation makes moving the camera and setting up the shot a breeze. Rated 4 out of 5 by Jtanico from Love this head! I bought this head to replace the one I had on it. It was a regular head with the long arm that always seemed to get in the way. So I looked up what ballheads are offered by Slik and I found this one. I loved that it has the levels on to tell you when you're straight. Extremely helpful!!! Yes, you can use the Slik SBH-200DQ on the Slik Universal 212 tripod. Is this ballhead compatible with the Slik 330DX tripod and/or is there a need for extra parts for it to be attached? This head can be mounted on the Slik 330DX tripod with the use of the provided bushing. Will this head fitFEISOL VH-60 Horizontal Adapter? Yes, this head will fit the Feisol. Does the base of this pan when you unlock it, or just the ball? Have a slik pro 340dx with ash-705e will the swap work and are theQR plates the same? The swap will work, and the plates are the same.